Since I’ve learned so much about blogging already, I’m happy to pass that knowledge along to all of you. If you want to contribute a blogging tips post, I welcome your guest posts. This week, we discuss the importance of using RSS feed readers when doing blog marketing. I know some of you have yet to adopt this useful technology. Builds links to your blog. Helps you build a connection with that blogger. Gets you on the the radar of other bloggers and advertisers. Expands your knowledge by reading other opinions and experiences. Leads direct traffic to your blog. So now that you know how important blog commenting is, what’s wrong with just bookmarking them in your web browser? It is what you do with all your other favorite websites after all. This approach is very inefficient with blog commenting. You will end up wasting far too much time loading blogs unnecessarily. For example, when you visit each blog that way, is there always a new post you haven’t read yet? When there is a new post, is it always something that you’re interested in and knowledgeable enough about to comment on? 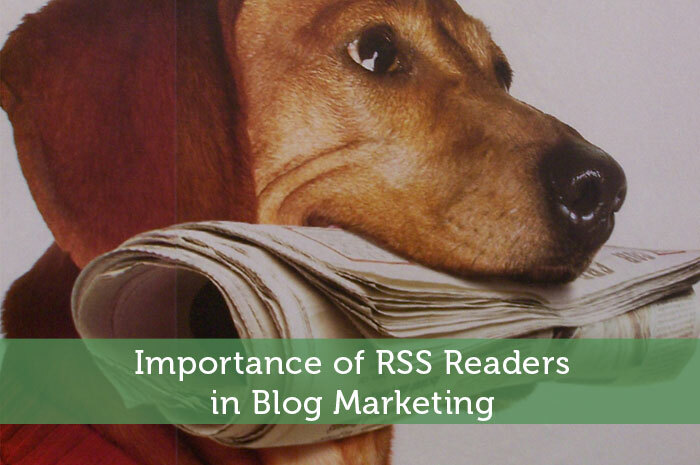 I was hesitant to start using RSS readers when I first got into blogging. I figured that my bookmarking routine was working for me. Why would I want to read posts in a separate browser? It didn’t really make sense to me. Then I clued into what I was missing out on and I haven’t looked back. Knowing About New Posts – Do you really want to try to remember each blog’s posting schedule? Some may post only 1-3 times a week while others post every weekday. Or there may be ones that always seem to post later in the day. When using an RSS reader, you know exactly which blogs have new content to check out. Getting A Post Sneak Peak – Unless you have the time and knowledge to comment on every single post from the blogs you follow, you are probably a little selective in which posts you comment on. In my case I tend to skip the ones that deal with US specific topics like 401Ks, IRAs and private health care. With my RSS reader I don’t have to load up the entire blog and its design elements to know I want to skip such a post. Ability To Organize and Prioritize – Technically you can do this with browser bookmarks too, but it is much more beneficial within an RSS reader. Each person will have their own way they want to organize things, but I have all kinds of categories in my RSS reader: 1 for high priority blogs that I want to comment on every post, 1 for blogs where I occasionally comment, 1 for blogs with dofollow links, 1 for investing blogs where I often just read without commenting and several other various categories. I also have notes on each blog for anything I need to remember, as well as their PR as an extra layer of prioritization. People who use different variations of their name when commenting can easily put in a note for something like that. Or maybe you want to put in a note reminding yourself that you owe them a favor. It really was night and day when I switched to using an RSS feed reader for blog commenting. I was suddenly saving so much time which could go towards commenting on additional blogs or doing other work. I’m sure you all like extra free time. As for which RSS feed reader to use, I used RSSOwl from the start without any complaints. The only real downside is that it is desktop software, which means I don’t have access to my list of feeds when away from my computer. If that is a concern, you can use a web based RSS reader such as Google Reader. Really, there is only so much that can be done with RSS reader software. So pretty much any reader out there should be sufficient. Do any of you want to admit to not using an RSS feed reader yet? I noticed some of you didn’t enter my recent contest with the RSS subscription options. So I know who some of you are 😉 If you’re embarrassed, you can e-mail me directly with any questions. I guess I’ll admit to not using an RSS feed reader. I never put much thought into it. As I was reading your post I realized I’m doing everything you described with bookmarking, then wasting time by randomly checking for new posts, etc. Thanks for the tip! I’m off to find a good RSS feed reader. Don’t worry you’re not one of the only ones. I think most new bloggers probably don’t use RSS feed readers right away. Who actually uses them besides bloggers anyway? If you need any tips for using them let me know. Interesting strategy. I offer RSS on my site for readers but I personally don’t use it. I tried it for a while but I much prefer email subscriptions. I go to my email anyways and read it every day so it is nice to have everything in one spot. That’s surprising that someone who’s been around blogging still prefers e-mail subscription. I guess whatever works for you. I personally get so many other e-mails that I wouldn’t want to clutter up my inbox any more than it already is. I guess it also depends on how many blogs you’re really closely following. Hmm very interesting ideas of how to organize ones schedule for blog-commenting. Definitely going to try this out. Yes I definitely recommend getting really organized with your blog routine. As you build up momentum, efficiency will be extremely important. You want to get as much done as possible in the time you do have for blogging. Jeremy, you have once again shown me the light. My browser is still trying to load 10 different blogs for me to read on my lunch break. An RSS reader would greatly reduce the effort I need to put into this. This is definitely another suggestion I will be using! Glad I could help you out MMD. This post was specifically for the bloggers who may be wasting a bit of time on having too many blogs open or checking back on blogs too often. Let me know if you have any questions about using RSS readers. I use Google Reader and love it. I use the starring feature in order to come up with my Friday link love posts. It’s much easier than trying to remember which post I liked or bookmarking them. I used to be an email subscriber but usually ended up getting the posts a day after they were actually posted. After awhile, I saw the light and went with the google reader option. I may have to give Google Reader a try sometime. I’ve just been comfortable using RSS Owl and had no reason to really try anything else. Knowing Google though they probably found a way to one up everyone else. You definitely don’t want to be getting the notification the day after or else nobody else will see your comment. It will probably take a lot longer too since you have to skim through comments to ensure you aren’t saying the same thing as anyone else. RSS Owl is pretty convenient. Well RSS feeds in general help a lot. It sure beats wasting time checking blogs manually only to find that some of them don’t have new posts yet or their new content doesn’t interest you. I use Google Reader for practically all of my blog reading in conjunction with an iPhone app to access it on the go. I love the idea of categorizing blogs into different groups and adding notes. Can you do all that with Google Reader? It would make things simpler. Right now I just have a big list of around 30 blogs to keep tabs on. I’m sure you can do all of that with Google Reader. With notes I actually just rename the blog in my reader. They likely have grouping or categories too. The “How RSS Feed Readers Are Superior” seriously opened my eyes. When I got into SEO, I only read that RSS was like subscribing to a magazine, and I did not think much more into it than that. It just seemed like people who collected magazines and let them sit… kind of like a doctor’s office. I like your points because those people did subscribe for a reason, and we should reward them for that loyalty. Outside of that, there is some link juice to be had with RSS feeds. Google Reader is my feed of choice at the moment, but I will have to check out RSSOwl.Thanks for the post, Jeremy. My blogging strategy just got that much better. Good point about RSS feeds also being good for some link juice. I just got recently approved onto a website that aggregates rss feeds from finance bloggers. So it will be nice to get the extra links to each post. I am a little wary of the ones that publish my feed in full with all the content. I don’t want to create duplicate content issues. I use Google reader and love it because I can access it from my phone. It is definitely a great way to stay organized but sometimes I have to claim feed bankruptcy and start fresh! I’ll probably have to switch to Google Reader once I finally give in and upgrade my phone. For now though, RSS Owl does the trick. I felt the same way when I started blogging! I thought, “I’m happy with bookmarking my favorite blogs, why do I need some new doohickey?” BUt now I see why. You know when there are new posts, you don’t end up with a million bookmarks, and man, it’s just easier! Yeah there are a lot of benefits, especially if you start following a lot of blogs. You don’t want to waste time loading them all up individually and then forgetting to check some. I use Google Reader and it makes everything MUCH easier. I can see what blog posts are new and if I’m interested in reading further. Another Google Reader fan. I wonder what extra features they have now. I figured with RSS Readers there is only so much it can really do. Nice post. I actually just finished writing on this exact same topic for my blog income/stats post next week. Yours is obviously written better though. 🙂 lol. I didn’t use a reader for MONTHS and it wasn’t until you told me about it that I started to use one. It’s made things so much easier! I do notice you being more effective with your commenting since you started using an RSS reader. You really don’t realize how useful it is until you start using it. That’s funny that you just covered the same topic. Google Reader is the way I go. It’s really easy to follow everyone I want to. I should’ve added a poll to see how many people are using Google Reader. If they can import my rss list, I’ll consider switching. I was just thinking about using RSS reader or Google Readers. Great post! Definitely something to jump on Ornella. It saves so much and really simplifies your routine. I’ve been in love with RSS readers for a while now, and I wouldn’t have it any other way. They really are convenient and save a lot of time. Although I don’t comment on as many blogs as I should, I definitely read and follow a lot of bloggers. My favorite way of reading the RSS feeds is with Feeddler app for iPhone and iPad. If you don’t comment on all the blogs you read, an RSS reader makes even more sense. That way you only have to load up their full blog if it is actually interests you enough to comment. A good smartphone app would be useful for this, but I’d want something that I could access the same list on my PC too. Hmmm. I only started using a reader fairly recently and quite like it. I do find that it decreases how much I click on ads on sites though. It is interesting to note how many commenters do not use RSS feeds themselves. Do you have any tips on ways to get people to bookmark your site and visit often? Unfortunately RSS feed readers are much more prevalent within the blogging community. Getting people to actually bookmark your site visit often just comes down to content quality. It might help to remind them to do so in some posts. Or sometimes hinting at what you will post in the future might help. For example, doing a 3rd part series or something of that nature might make people want to come back for the rest. The multi-step series are a great idea, thanks! Regarding Google Reader – …I don’t know that it’s that great, just that it’s easy when you already use a host of google products. That said, I haven’t really played with it extensively, other than to repeatedly attempt to get a favicon to work in my feed, and failing. You might just need to change your favicon to favicon.ico. Maybe it’s ignoring it as a png. You can probably convert it with microangelo. I would think Google Reader has all the same options as most other RSS feed readers. Nice post. I have to admit that I too am guilty of just bookmarking sites and going to them each day. Worse yet, I have set up Google Reader, but have never really used it. Thanks to your post, I am going to give it a go again and see if I can save some time. Well at least you’re already halfway there. Now you just have to subscribe to all your bookmarked feeds. It’s just a matter of getting used to a different routine and then you’ll start noticing how much more time you have. I used to bookmark everything but once I started my blog I finally started using my Google Reader and now I don’t know how I lived without it! I do wonder if they’ll ever gain popularity amongst the average web surfers. Based on the subscriber counts on some popular blogs, people must be using them. Still I think most people still stick to traditional bookmarking not realizing the benefits of using RSS feeds. I confess I either bookmark or google search other’s blogs. I googled to get here. 🙂 I wasn’t fully aware of the rss feed benefits until reading this. Now I’m going to check out the one you use. lol yeah if you’re googling blog names it can’t be very efficient. You’re bound to notice a big difference once you start using RSS feeds. Hey thanks for including me! I really appreciate it and I’m planning on including you in my Friday post. I do NOT utilize RSS :0 I have started to kind of look into it using Google Reader, but I do just have a whole list of blogs in my favorites folder that I open up each day. It works for me, for now. If you have a big list in your favorites, you must be forgetting to visit some or else wasting time looking at some unnecessarily. I highly recommend you you switch to a RSS feed reader to improve efficiency. My problem is that I have too many blogs in my Google Reader. It’s not uncommon to open it up and find over 50 posts. I’ll skim it, but I’ll click on a post to go to the site and comment only once ever couple weeks. I do however, have about a dozen blogs bookmarked in a folder labelled “Read Daily.” (Hint, this is one of them!) They are my favorites and the ones that I will comment on almost every single post. Some days, I’ll visit those blogs twice in a day, to see if there is a response to my comment. I have groups like that in RSS Owl too. Some blogs are just difficult to comment on regularly for one reason or another. So rather than having them clutter up your main list, it works much better to put such blogs in separate categories based on priority. As for checking back on blogs to see replies, I admit that is something that I need to improve upon. It can be tough to remember who normally replies back to comments and how quickly they do so. Yes it would be nice if there was an easier way. Even when you can subscribe to comments, you usually end up getting everyone else’s comments which is no good. I’m the opposite right now. I setup google reader, subscribed to WAY too many blogs and tapped out. I am using bookmarks now, but I think my issue was that I did not organize or prioritize the blogs in my reader. I think I need ot put a little time into that, now that I have found a few favorites and can sort them. As usual, you gave me some tips that will save me my most valuable asset: time! For sure, you do need to properly organize them. If it is just one big list that would be quite overwhelming. When it is is all categorized, you can direct your energy towards the specific blogs that are important to you. And then you can get to the other blogs when you have time and easily see which posts you haven’t read yet. I love using my Google reader to prioritize! Just so you know, you’re in our “favorites” list! I personally think getting (and giving) the post in full is nicer, but if you’re in my “favorites” folder, you don’t have to worry about me not coming to your blog daily. I just sometimes like to read them in sections. With kids and appointments and such filling up my day, I often will begin to read a post, go do something else, then come back and read the rest later. I’m probably weird, though! Sweet, I made the favorites list! You’re definitely in my top priority folder too. To me it doesn’t matter if they put the full post or just an excerpt in the feed. Either way, you know if you’re going to want to read it based on who it’s from and the title. I know certain people getting pretty annoyed when the full post isn’t in the feed though. Woohoo something that you’ve posted about that I actually already do! I use RSS for all of my blogs, but I never really thought about categorizing them like you’ve mentioned, I’m definitely going to start doing that because at the moment they just all together and unfortunately that means that the ones at the bottom don’t get as much attention. Great post! I would write a blogging ebook, but I don’t feel like an expert on it after just 6 months. It’s not really in the long term plans for this blog either. It just makes sense at this stage of the game. I’ll keep the tips coming for now. I do recommend you switch to Google Reader or another RSS reader eventually. When you pick up the pace on the networking and other marketing, you won’t want your e-mail inbox too cluttered. Perfect timing for this post as I am currently I the process of setting up and organizing how and who I read and comment regularly on. I have gotten into some different interests but stil love the personal fianance and want to make sure I remember everyone. I didn’t realize you could set up folders and stuff like that with the google reader so I will be spending time on that this week. Thanks again for enlightening me. No problem Crystal. Helping my blogging friends is the main point of this blogging tips series. Different people will want to organize their RSS reader differently, but the key is that you find a system that works for you. Ideally it helps you become more efficient by spending more time on the blogs that interest you the most. Good to hear you started a blog. I recall going to your website a while back and was disappointed there was no blog. I hope to see you around the blogosphere. Sigh I hate that word…can’t believe I just used it. Nerd alert!